Do You Really Need Backup Glasses? But many people will be asking the question, "WHY do I need backup eyeglasses?" especially if you wear contact lenses all the time. The average person does not seem to understand the importance of having backup eyeglasses. Licensed professionals are used to explaining the reasons for having a backup pair of glasses, but many people think that it is just a way for optical stores to make more money. In my personal experience, there have been countless times that contact lens wearers are in a panic because they have lost or torn their last contact lens. They say, "You have to help me!" "I drive a (truck) (bus) (taxi) and the police pulled me over..."
"I can't see at school"
These people are so dependant on seeing for work and life (isn't everyone?) but if something happens to their contact lenses, they can't comfortably function! Why would they do this to themselves? A backup pair of glasses would have solved this problem. If you are dependent on your contact lenses for seeing (in other words, anyone except those wearing non-prescription colours), you should always have a pair of backup eyeglasses available to use. And not just a pair of 10 year old glasses you wouldn't be caught dead in! Why Don't You Have A Backup Pair of Eyeglasses? One of the biggest reasons people wear contact lenses is... they hate glasses! They hate wearing them, they hate the way they look in them, they hate the way they restrict their vision peripherlly. Yes, glasses do have a lot of drawbacks. #1. What Happens If You Can't Wear Your Contact Lenses? The main reason to have a pair of backup eyeglasses, is in the case that you cannot wear your contact lenses, for medical reasons. It is usually something unforeseen. In all of the above cases, you should not wear contact lenses. The only way for many people to function is to have a backup pair of eyeglasses. Please do not wait until to you are in an emergency situation to ensure you have a backup. Sometimes you just don't want to wear your contact lenses. In all these cases, if you're like most contact lens wearers, you need glasses as a backup to see, and to function. If you have no contact lenses left, you should have glasses to wear. Eyeglasses don't have to be the cumbersome, boring and nerdy. (Although that can be cool too!) As an alternative to contact lenses, glasses come in a wide variety of fashions and styles, and the lenses don't have to be coke-bottle bottoms anymore! As long as you are educated on what's available and the best lenses and frames for your face, you can get some very stylish eyeglasses that you actually enjoy wearing. Try on lots of different styles! Don't be shy about trying on frames. You won't know if they look good on you or not, until you try them on. And just because someone who works there suggests a frame, doesn't mean it's the best frame for you. Try frames on until you find one that looks like you belong in it. However, an optician may have a good reason for talking you out of a particular frame: for example, if you have a high prescription, and you've chosen a large frame. Get lots of information on the lenses you need. Lenses can come plain (and inexpensive) or with lots of different coatings. The prices for these coatings can vary, so do some price checking. If you want backup glasses you'll wear more often (and not hate!) you should get extra coatings to make them exactly what you want. Once you have an idea of what type of frames and lenses you need and/or want, check around for the best prices. Between optometrists, retail opticals, and online, there is a lot of competition out there, and you can get some great deals. Backup eyeglasses are not just an accessory or a luxery item, they are a necessity. And they don't have to be really expensive. There are many discount eyewear stores that will provide you with decent quality glasses at an affordable price. 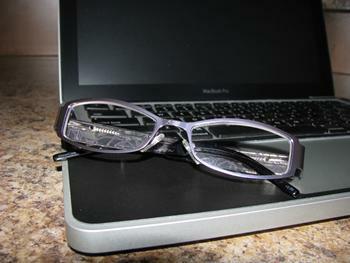 You can also consider buying a pair of backup eyeglasses online - check out our page about online eyeglasses.